Marco Frisina: The Power & Glory of Music - This is a trailer/teaser for a feature documentary on this gifted priest and composer from the Vatican. 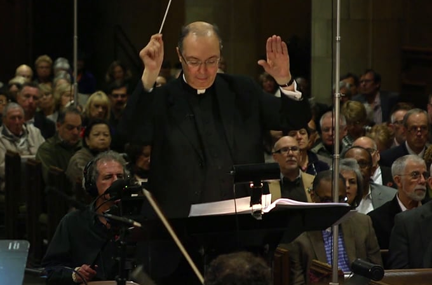 He is a renowned Italian composer of Sacred and Liturgical Music as well an accomplished and award-winning composer of music for film and television. As founder and director of the Choir of the Diocese of Rome, he conducts concerts throughout Italy and in many other countries. He has only recently come to perform concerts of his work here in America where he is just beginning to become recognized. TEACHING SUCCESS - This is an 8-minute trailer for a documentary film produced by the non-profit organization Schools That Can. It is about the groundbreaking educational techniques and strategies now being implemented at many intercity schools across the country. The film will feature leading psychologists, school leaders, teachers and students who are making a difference and inspiring others. The Skin You're In - This is a trailer/teaser for a feature documentary about the astonishing African-American health disparity - why it exists and what can be done about it. The film will have leading experts that will explain why blacks are dying so much younger than every other ethnic group in America and what can be done about it. But mostly the film will seek to see the problem first hand in the everyday lives of African American families telling their stories, and introduce the audience to people who are making a difference. In Money We Trust - This is a fundraising teaser for a documentary we are doing with Maryland Public TV, chronicling how money is changing and how it has helped define modern society.